It seems that about every thirty years Cuba’s economy has been buffeted by an economic cataclysm. The War of Independence in the late 1890s devastated the economy and decimated its population. The Great Depression affected Cuba deeply in the 1930s. The Socialist Revolution created massive economic upheaval in the 1960s. Then the dissolution of the Soviet Bloc in the early 1990s upturned many of the economic underpinnings that were laid during the country’s Socialist transformation. The focus of this paper is Cuba’s response and economic performance during and after this latest debacle. The literature published in the Proceedings of the Association for the Study of the Cuban Economy (ASCE) is rich with excellent work pointing to the myriad of problems, deficiencies, and contradictions imbedded in the Cuban economy. But this paper will present a contrast to this past trend in interpretation. More precisely, it will stress that even though the cup of the Cuban economy may indeed be half-empty, it can also be viewed as half-full. One’s view will depend on what one compares Cuba’s recent economic performance to. On the basis of many development indicators and on output performance relative to economies in similar circumstances, the comparison is frequently favorable. As the decade of the 1990s commenced, Cuba was an integral member of COMECON, the trading organism of the countries that composed the former Soviet Bloc. These were principally the Soviet Union and the countries of Eastern Europe. As a member of that organization, Cuba’s foreign trade and, in turn, its domestic production were subsumed into the logic of the organization. Under this mode of economic planning, each country was to specialize in what each was supposedly best suited to produce. Cuba was relegated to specializing in low value-added tropical products for the group, including sugar, citrus, and tobacco. In return it was to receive fuel, grains, and capital goods from its partners. Moreover, the terms of trade in this trade pattern were fixed for five-year periods, and a system of soft financing was in place for any accruing deficits (CEPAL 2000, p. 46). By the end of the 1980s, 85% of Cuba’s foreign trade was with its COMECON partners. It was also a trade-dependent nation, with imports representing 41% of GDP, and foreign suppliers representing 37% of total internal demand (CEPAL 2000, p. 68). Essential items such as cereals, vegetable oil, shoes, and clothing were imported almost in their entirety. Yet the export sector had also become stagnant during this time, producing chronic trade deficits of around two billion pesos per year in the last half of the 1980’s (CEPAL 2000, Cuadro A.3). These trade deficits were accompanied by delays in completing investment projects, a ballooning fiscal deficit, and increasing inefficiencies in the agricultural sector in terms of output per unit of input (CONAS 1994, p. 12). The result was a stagnant overall economy with per capita GDP declining 3% between 1985 and 1989 (CEPAL 2000, Cuadros A.1, A.2). Moreover, by 1986 Cuba was already unable to service its hard currency debt and had declared a debt moratorium (CEPAL 2000, p. 69). The picture that emerges in 1990 is one of an economy that was troubled despite being buoyed by soft credits and stable terms of trade. It was import-dependent, yet its trading partners were distant. Its industry possessed generally antiquated technology, and its export sector was showing growing inefficiency. The situation was probably not viable in the long run. Yet the trading system that was underpinning the whole economic structure of the country disappeared almost overnight. Almost instantly, Cuba’s terms of trade savagely turned for the worse as its traditional trading partners began to insist in buying and selling at prevailing market prices which usually disfavored Cuba’s few export products. Concomitantly, the country’s credit lines disappeared. A country almost entirely dependent on imports found it difficult to buy anything abroad. The result, as we all know, was not pretty. As stated earlier, the ASCE literature is rich with analysis of the events that Cuba experienced in the early part of the decade. So we will present only a cursory overview of the disaster. 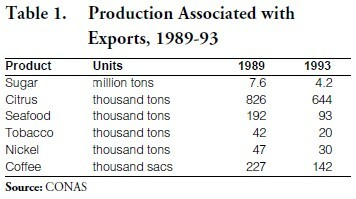 Imports decreased 50% during the period 1990-93. As dependent as the economy had been on them, the shrinkage in economic activity had to be wide and large. Thus GDP decreased 30% (ONE 1996). By this measure the shrinkage beats that experienced in the United States during the Great Depression (27%) from peak to trough during 1929-1933 (BEA). Gross internal investment decreased 86%. Consumption decreased 24%, hitting even the diet. Daily per capita caloric consumption declined also 24% (FAO). The fiscal deficit ballooned 158% (CEPAL 2000, Cuadro A.13). Without credit lines, exports were the only lifeline to the outside world on which the country was so dependent, yet they declined 67% (ONE 1996). Table 1 elucidates the disaster that befell the main foreign exchange earners of the country. To add salt to injury, the American economic sanctions were made even more restrictive by the passage of the Cuban Democracy Act (CDA) in 1992. Among other provisions, this law prohibited sales to Cuba by foreign subsidiaries of American companies. This trade was not insignificant. Between 1980 and 1992, American subsidiaries exported $2.6 billion and imported $1.9 billion to/from Cuba (USCTEC, undated, p. 2). Since most of this trade occurred while the COMECON system prevailed, it was ostensibly because the products, quality or prices of the American subsidiaries could not be obtained from other suppliers. The passage of the CDA eliminated these advantages overnight. These developments can be fairly characterized as an economic catastrophe, perhaps with few equals in history except in time of war. Many outside experts reasonably foresaw a quick end to the Socialist system on the island. Indeed the proceedings of the ASCE were named Cuba in Transition and among the original goals of the organization was [emphasis added by author] “to study the elements and processes involved in the expected transition of Cuba to a free market democracy” (ASCE). The papers covered the problems and challenges of such a supposedly upcoming transition. Cuba did indeed undertake a series of reforms although mostly not of a free market variety. Again, much of this turf has been covered in previous papers, but it would help to summarize them. For if the reforms were not as market oriented as some might have wished, they were nevertheless substantial and have had, as we shall later see, a marked beneficial impact. The reforms can be divided into two general types: bureaucratic/structural and financial/monetary. 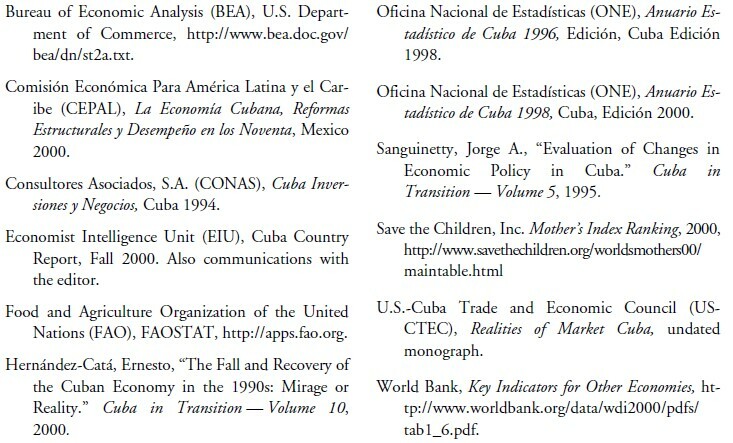 They can be summarized in Tables 2 and 3, largely taken from CONAS, a Havana consulting firm. Perhaps the essence of the Cuban economic miracle — alluded to in the title of this paper — is that this reform program has proven sufficient to keep the proverbial cup from emptying altogether, so that today we can argue about whether it is half-empty or half-full. To the surprise of many outside observers, there has been no implosion of the economy. There has been no famine. The Communist tenet of control of the means of production by the state has been kept largely intact. And by any measure, economic conditions in Cuba have indeed improved since the 1993 nadir, despite a strengthened program of American economic sanctions, which if of debatable impact, is in any case unhelpful to the country’s economic recovery. How should we compare Cuba’s economic performance during the decade? One fair way is to compare it with that of its former peers who were also beneficiaries (or victims, depending of one’s point of view) of the COMECON trading system and who have also had to adapt to its sudden demise. 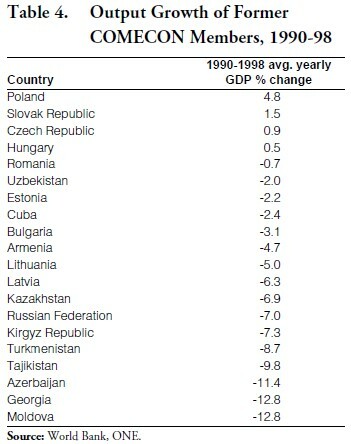 Table 4 lists the countries in the former Soviet Bloc and their change in GDP during the 1990-98 period. Judging by the gross change in output, Cuba does not compare too badly, easily beating out its former mentor and even some countries of Eastern Europe that have not had the added disadvantage of being far from suppliers and markets. Taking into account the growth figures for 1999 and 2000, 6.9% and 5.6% respectively (EIU 2000, 2001), Cuba would probably make an even more favorable comparison. In these simple terms, Cuba has been an almost unqualified success. It has overcome the disappearance of COMECON much more ably than most of its former co-members. The limitations of GDP as an indicator of development, however, are well known. Among these are price differentials between countries, false readings due to abrupt exchange rate changes, and differentials in income distribution. Countries with highly skewed income distributions might score high on average income, but not on other indicators because a substantial proportion of its population may not have access to essential services such as potable water or healthcare. To get around this problem, the United Nations Development Program (UNDP) has developed a Human Development Index (HDI) that, in addition to per capita GDP adjusted for prices, also considers other parameters such as life expectancy at birth, the adult literacy rate, and school enrollment. Most countries with high per capita GDP also score high on the HDI. However, others, especially some oil-rich Middle Eastern countries do not. Despite having high average incomes, essential services in these countries are not as widely available as their income might suggest. Every year since 1996, the UNDP ranks the countries of the world by their HDI score. Leaving out for simplicity the Asian rump of the former Soviet Union, the rankings from 1996 to 2000 have been as shown in Table 5. Like many in the former COMECON Bloc, Cuba suffered steep downgrades in its rankings. However, like the more successful cases in Eastern Europe, it has also staged a dramatic comeback. And today, in terms of more encompassing indicators of development Cuba holds a middle ranking in comparison with Eastern European countries. Given the readjustment the country has had to make because of the long distances to its former trading partners, and the fact that it has always been regarded as a “developing” rather than an “industrialized” country, this ranking cannot at all be considered a sign of failure. The Cuban government might even be allowed a little hubris. 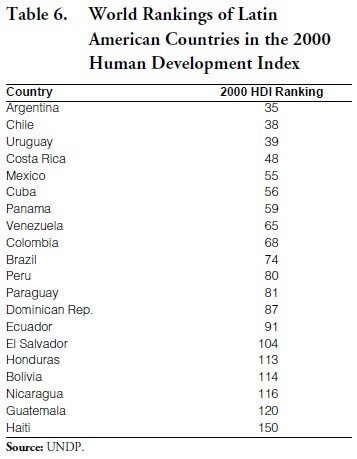 Comparing Cuba’s HDI ranking to its “developing” Latin American neighbors that have had similar historical development traits, is also poignant. 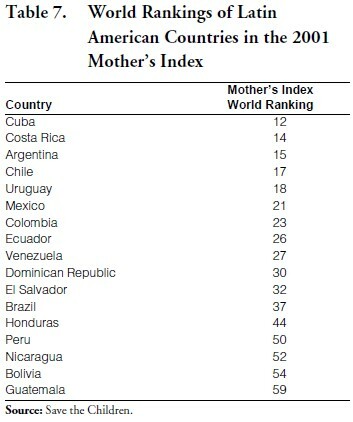 Cuba ranks sixth among 20 Latin American countries (Table 6). Again, this is quite an achievement for a country that ten years ago was in the midst of its own version of the Great Depression. Other development benchmarks tell a similar story. Save the Children, an international child welfare organization, has developed a Mother’s Index, a composite of indices for women’s and children’s wellbeing. The indicators used for the women’s index include the lifetime risk for maternal mortality, the percent of women using modern contraception, the percent of births attended by trained personnel, the percent of pregnant women with anemia, the adult female literacy rate, and the percent of national positions held by women. The children’s indicators include the infant mortality rate, the gross primary enrollment ratio, percent of under-fives suffering from moderate or severe nutritional wasting, and the percent of the population with access to safe water. As with the HDI, countries are ranked according to the index score. Unfortunately, only 106 countries are included (versus 174 for the HDI), and many of the Eastern European countries are absent. However, many Latin American countries are present (Table 7). Using this set of development indicators, Cuba outscores all its Latin American peers. Despite all the travails the country has suffered, its women and children seem to be well cared for on an international scale. During the early part of the 1990s, Cuba suddenly lost the entire basis for its international economic relations. Trade patterns established by fiat had to be quickly substituted with market-based flows. 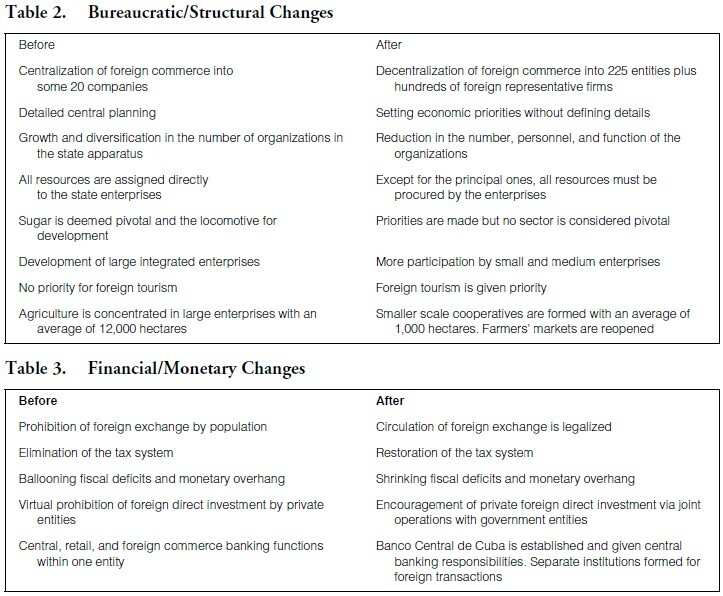 At the same time, the program of American economic sanctions was strengthened, first with the Cuban Democracy Act in 1992 and then the Cuban Liberty and Democratic Solidarity (Libertad) Act in 1996, the latter largely designed to restrict flows of foreign direct investment into Cuba. The Cuban economy went into a steeper dive than that of the United States during the Great Depression. Even the caloric consumption of the population was greatly reduced. Many foresaw a quick end to Cuba’s Socialist regime and a transition to a market-oriented economy. Cuba indeed began a program of reforms in 1993, and they necessarily obeyed the reality of the international marketplace. But they did not obey capitalist strictures for reducing the scope of government in the domestic economy. These reforms were given short shrift and sometimes not even considered “real economic reforms” (Sanguinetty 1995, p. 3). They were judged not to be consistent with long-term economic growth. Even last year it was deemed that some backtracking on the reform process was responsible for slower growth in 1997-98 (Hernández-Catá, 2000, p. 36). Yet growth shot up again in 1999-2000. It is safe to conclude that Cuba has confounded its critics. During the early 1990s the socialist system was deemed terminally ill and then the government prescribed protocol of cures was considered ineffective. Yet the patient continues to live and even appears to be doing better. It is, in fact, doing better than many of the other COMECON patients admitted to the economics hospital at about the same time. Perhaps socialist true believers in Havana never doubted their eventual success. But market-oriented economists may be forgiven if they deem Cuba’s recent performance as a miracle, even if perhaps a politically lamentable one. Whether Cuba is now aboard a new platform of consistent growth remains to be seen. Complex economic problems certainly continue to beset it, including a new deterioration in its terms of trade beginning in the second semester of 2000. But in purely economic terms (as opposed to political), it is not unfair to claim that Cuba has already managed to turn a catastrophe into a cup at least half-full.